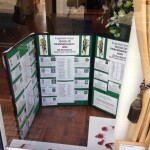 The window of Lodge Brothers Funeral Directors in Englefield Green has two recent additions. Not only is there a display representing the proposed new War Memorial for the cemetery in the village – please see other entry here on this site – but there is also a list of those from the village who have died in the two world wars. Local research has found the names of these heroes who didn’t return to Surrey after serving King and country, and we at Lodge Brothers salute them. Poppies now adorn the window at this time of Remembrance. The branch of Lodge Brothers in Englefield Green is positioned perfectly, opposite the cemetery in St Jude’s Road, and Susan Areington is there to greet you.